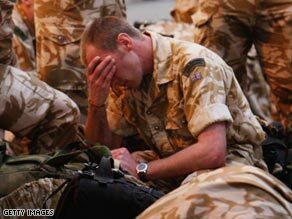 LONDON, England (CNN) -- The British military marked a grim milestone Friday as the number of troops killed in Afghanistan surpassed the death toll in Iraq. A British Marine is shown in Arbroath, Scotland, last year on the eve of a six-month tour of duty in Afghanistan. An especially bloody 10 days in Afghanistan's troubled Helmand province claimed 15 British lives, putting the total number of dead in that conflict at 184, the Defense Ministry said. The British military has lost 179 soldiers in Iraq. Five soldiers were killed Friday in two explosions that rocked the same patrol near the town of Sangin in Helmand province, where British troops are based. The Defence Ministry earlier announced the deaths of three other soldiers in Helmand. "It's important we also remember why our people are fighting in Afghanistan and what they're achieving through their sacrifice and their courage," Stirrup said. "The mission in Afghanistan is about supporting the delivery of governance in order to reduce the opportunities for extremist terrorist groups who are a direct threat to the United Kingdom, its citizens, and their interests." Results are starting to emerge, he said, but the military still has a long way to go. British Prime Minister Gordon Brown spoke about the military casualties while at the G8 summit in Italy on Friday, calling it a "very hard summer" so far for British forces. "Our resolution to complete the work that we have started in Afghanistan and Pakistan is undiminished," he said. "We knew from the start that defeating the insurgency in Helmand would be a hard and dangerous job, but it is vital."